Rubenerd: WordPress memory lane, and time to move on? WordPress memory lane, and time to move on? WordPress 3.3 continues the mad march to add more features, fueling further desire in me to move to something else. Insert old man voice here! 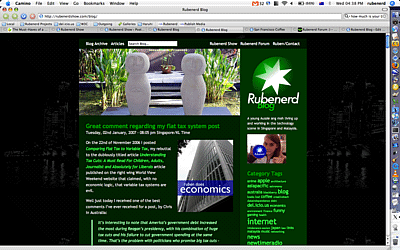 When I first started using WordPress 1.6 in Febuary 2006, I was excited at how much easier and cross platform it was to create posts, though I was disappointed at the lack of tag support. As a stopgap, I used a Technorati tag plugin, and used categories as tags, a decision I'd regret several years later when WordPress finally got native tag support and I had hundreds of categories! With the aid of a graphic from that ridiculous[ly fun] IDOLM@STER Xenoglossia anime and Bugs Bunny, I talked about the problems I faced with all these categories in 2008. Anyway, I belabour all this nostalgia to point out that since the introduction of tags, I don't think WordPress hasn't added anything I've used on a regular basis. I still upload all my material via SFTP/SCP, edit HTML rather than using the visual editor, mess around the backend with phpMyAdmin rather than using the GUI tools, and most of my plugins I've either written myself or sourced from other places are designed to disable features, rather than add new ones. I don't use the Links or Media sections at all, and have avoided using too many feature plugins so I'm not locked into the WordPress platform. I don't even use the standard web interface! That's not to say those features aren't valuable or useful to the vast majority of WordPress bloggers. As with a lot of online services and applications, the initial simplicity from it's early days which attracted me to it have made way for more features to cater to its greater audience and market share. Aside from perhaps the i17n features of WordPress 3.3, and despite the hours of tireless effort and work put in by Matt and the WordPress team, this is the first major release I'm scratching my head and wondering if anything here is useful to me at all. Complexity is one of the enemies of security, and frankly (for my needs) all I see is an even larger zip file and more files that need to be updated and maintained, most of which I'll probably never use. I'm tentatively moving over to the (almost ten times!) smaller, simpler and nicer to use Textpattern software once a few outstanding issues are resolved, but this latest WordPress update has even got my nostalgic for my Perl CGI days. Now that was something that was easy to update and keep simple, and I even had support for different timezones which as far as I know (though feel free to correct me if I'm wrong) WordPress still doesn't have despite promising it to us for over half a decade. Old man voice, over and out!